What's With This 100 Days Nonsense? » I Mean…What?!? What’s With This 100 Days Nonsense? 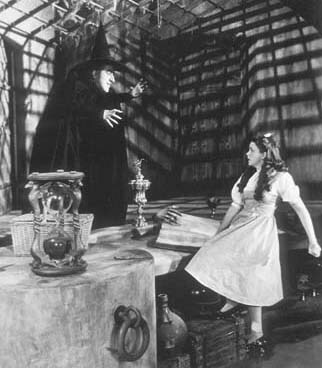 Scare tactics...the Wicked Witch must have been a Republican. Here’s what we know: Rome was not built in a day. Here’s what we think: The Lord created heaven and earth in 6 days. And if you believe that, then I have a plot of land in the Poconos I’d like to sell you. I mean…what’s with this 100 Days nonsense and these phony benchmarks? Obama is doing the best he can given the situation he is in. What do we–the public he is trying to help–benefit by laying on more pressure? Sure, I know the pundits, Republicans and bloviators need something to talk about. But turning over the 100 Day hourglass is such a lame marker for success. “Like sands of the hourglass, so are the Days of Our Lives”, which makes no sense, kind of like the 100 Day thing. And then what happens on Day 101? More doom and gloom? It’s like in The Wizard of Oz, when the Wicked Witch threatens Dorothy by turning over the hourglass. Sure, it scared the beJesus out of her and every little kid, and may have contributed to Judy Garland’s addiction to pills…she was sooo convincingly scared. Heck, it probably contributed to my addiction as well. But I digress. Napolean, looking all Fire and Brimstone and Republican. I’ve read all these reports and comparisons of Obama’s 100 Days to the other presidents of the last century. Enough with the comparisons. The Republicans are having a field day…literally…flying over the White House like vultures ready for Day 101 to start picking at the carcasses of the new administration. And on another note: Deficit Shmeficit. So, we’ll have a 9 trillion dollar deficit. We don’t die because of a deficit. The world doesn’t end. Those friggen Republicans and “moderate Democrats” with their exhausting Fire and Brimstone speeches are grating on my nerves. They act as though the end of the world is nigh. I’ll tell you what is nigh…the Republican party. 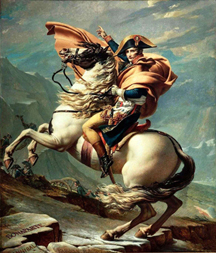 In closing, the “100 Days” historically references Napolean Bonaparte’s return from exile in Elba to Paris. So I say, let’s send all of Obama’s nay sayers into exile, within the next 100 Days.